I am writing about milking cows. We live on 12 acres is East Texas. We moved here about a year ago. I always said I would never milk anything, but things change. I have Nubian milk goats and I am just not satisfied. Milking two gets me less than three quarts a day. You can not easily separate it and my husband thinks the cheese tastes goaty. I agree on the soft cheese. So my question for you is do you milk once or twice a day? If you milk once a day, how do you get to that point with the calf? How long til you can separate the calf from the mom for the night? Cows are much larger than goats, hence I didn't get one to start with. A little nervous. But I really like making cheese. Excellent article in Backwoods Home Magazine on cheese making by the way. So I think I am going to need to upgrade to a cow. Also any suggestions on buying one? Should I go to a dairy or buy one from someone on Craigslist? Regarding milk cows: I think it depends on what breed you get. For years and years we had only Dexters, which are a small dual-purpose (milk and meat) breed and I milked two cows. But then our neighbor got a Jersey and I fell in love with the breed, so we got Matilda. With the Dexters, because their milk output is not huge, I felt comfortable milking just once a day (I'd separate the calf at night and milk in the morning). But when we got Matilda and since she came off a commercial dairy, she had no calf on her and I was forced into a twice-a-day milking schedule. The rewards were tremendous - huge amounts of creamy milk, so I made butter and cheese like mad - but the schedule was rather unforgiving. It's not like I could skip a milking, after all, or the poor girl would burst. But an interesting thing happened after Matilda had her calf last year - the calf took a lot of the cream and a lot of the milk, and though I was still milking twice a day, her output was FAR less (actually, this was a blessing - who needs five gallons of milk a day?). So I dropped to milking once a day (evenings) and that worked fine. Then as Matilda adjusted her output, I actually got lazy and stopped milking altogether. (Frankly it was a nice break.) I certainly could have continued milking but as I said, I just got lazy. So to answer your question, a lot will depend on whether you get a heavy milk-producing breed or not, and whether you keep a calf on the cow or not. A cow will adjust her milk production to the demand. If both you and a calf are taking milk, she'll adjust her output higher. If you forego milking and just leave the calf on her, she'll adjust to that. Frankly I like the once-a-day schedule and sharing the cow with her calf. I think it's healthier for the calf to be raised by its mama (and I think it's beneficial for a cow to raise her own calf), and a once-a-day schedule means you're not a slave to your cow. You can occasionally skip a milking by keeping the calf with the mother at night, for instance. I like to keep a calf exclusively on the mother for two weeks. This bonds the animals and insures the calf gets all the colostrum it needs. Then if you plan to separate the calf at night, make sure you do so in such a way that the animals can still see and smell each other, such as a pen for the calf. If you just spirit the calf away at night and the mother has no idea where her baby has gone, she'll break the barn down in a frantic effort to find her calf. But if they can see/smell each other but are just physically unable to touch, there will be a lot of loud complaining but at least the cow knows where her baby is. It takes about two or three weeks for them to stop complaining and get used to the idea of being apart at night. If I were to recommend a breed to a new milker, I would recommend a hand-raised Jersey. Dexters are a more spirited breed and may be a difficult adjustment, but if you're familiar with handling cows they're a fine breed to get. If you get a Jersey - and if we could do it all over again and if we had more money - I would get a healthy four-quarter cow (meaning, all of her udder quarters are working) with NO history of mastitis. You'll pay more but we had a nightmare case of mastitis when we got Matilda and I wouldn't wish that on anyone. Since getting Matilda I've learned a great deal about udder attachment. Matilda has a terrible udder attachment but our neighbor's Jersey has a superb udder attachment. When looking over a potential animal, see if you can bring along someone who is knowledgeable about such things to help guide you. Commercial dairies tend to sell off their lower-quality cows. Be careful with a Craigslist listing, as you don't want to pick up a sick animal that someone is disguising as healthy. With a cow, you really do get what you paid for. We paid $500 for Matilda and, while I love her to pieces, that's all she was worth. Our neighbors paid about $2000 for their Jersey, and she is a far higher quality animal. Ah well, live and learn. 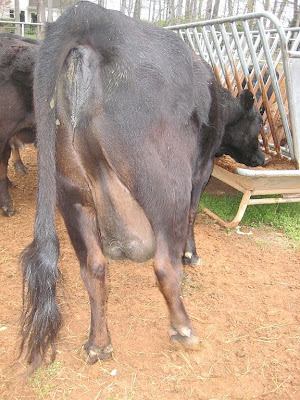 Dexter cow - poor udder attachment - see how saggy-baggy she is. With udders, a poor attachment looks "saggy baggy." A good udder attachment means the udder is held tight and close to the body. Ideally teats should be not misshapen and not poking out in all directions. Dexter cow - excellent teats - all uniform. Hope this helps! If you don't mind, I'm going to post your question and my answer on the blog so everyone can see it. WOW!!! Thank you so much for the pictures! This explains a lot more. Your posts have been the salt to our homeschool lessons today. Very informative! I milk once a day with a Jersey, but I don't have a calf on her. The way I did it would be the same way you would do it with a human nursing infant: cut back a little bit each time until you drop the milking. I've done this with two Jerseys now and never had mastitis. Good luck! Boy, this is really helpful and interesting! I've only dealt with beef cattle and have always wondered about a milk cow. Our neighbor has a Jersey and we have thought about getting one ourselves, but not sure if we are getting a little too old for such a thing. There are just the two of us and I wonder if we would be able to use all of that milk. Is one cow too much for two people? Great post! I've always wondered about stuff like that. I'm trying goats for now. Moving up to dairy cows soon. I have beef cattle now. We will see how things go. OPCCook, a Jersey might indeed provide too much milk for just two people. They're good for families. There are a couple ways around this. One, you can "cow share" with neighbors. For about a year, we milked our neighbor's Jersey in exchange for the milk. Or, if you kept a calf on the cow, you would only have to take the amount of milk you want, and the cow will adjust her output to what is taken. Do you stop milking her before she has a calf? If so how long before? To stop milking her without a problem with mastitis, do you just not milk her all the way out for a while or is that a problem? Yes, I stop milking about two months or even three before a cow is due to calve. Actually many cows tend to dry themselves up in order to marshal their resources into the growing fetus, in which case it all sort of takes care of itself. With mastitis, the more you milk a cow, the better. That's why having a nursing calf is a help in keeping mastitis at bay - the calf will nurse throughout the day rather than just morning and evening (which is when people milk their cows). K in OK, under 2 feet of snow. Just an extra to Patrice's comments about too much milk. There is another alternative if your cow is relaxed about who gets to belly up to the bar (so to speak). Matilda isn't too particular about which calf(s) she will allow to nurse. This allows for an interesting opportunity. If you go to a feed lot or a cattle auction you can often pick up a young calf or two for very little money. If the nursing cow will accept them, you can raise a couple of beef cows essentially for free for quite a bit of their first years growth. Oh I do strain the goat milk. Twice actually. And we have no buck on the property. I think the taste comes from the starter for the soft cheese. I tried a different starter and the goaty taste was absent. @ Husband of the boss, I was thinking along those lines as well. If I got a bottle cafe and the cow would allow it, it would give me a little freedom if I had to go to Houston on business. Plus you could sell the weaned calves! $ back is always good. A good resource is the Keeping a Family Cow website. It is a proboard and very helpful. There is also a book by the same name by Joann Grohman,a moderator of the site. http://FamilyCow.proboards.com or google family cow. I have learned a lot from the people there. Hi, Pat. Your blog has been a great source of information for me. We live in South Central Alaska on just under 5 acres with good field grass for our single cow. Lambchopis a 2 year old Holstein/Brown Swiss mix. She's a BIG girl and about to deliver her first calf. We're very excited. I like the idea of once a day milking and letting the calf spend the day with Mom. But how long until you wean the calf, or until Mom does it for naturally for you? I never wean calves -- I let the mamas wean, which they'll do naturally shortly before their next calf is born. Lambchops comes from a lineage of heavy milk producers, so you could certainly milk twice a day if you want and she'll have plenty left over for the calf. But you should easily be able to settle into a once-a-day schedule (my preference is to milk in the morning after separating the calf at night).